Colorado River rafting is one of the most exciting things to do in the summertime with family and friends. And Shoshone, a favorite Class III section of the Colorado River, is in a prime location for adventure-seekers visiting Vail, Aspen, and Glenwood Springs, Colorado. With exciting, family-friendly rapids and intermediate paddling intensity, the Shoshone section of the Colorado River runs through the heart of Glenwood Canyon, an area known for its stunning natural scenery that includes towering rock walls, hot springs, and opportunities for wildlife viewing. The Timberline Tours Shoshone rafting trip begins at our boathouse in Eagle, Colorado, where you’ll get outfitted with all you need for the trip. After rafting the Shoshone section of the Colorado River, guests will end up in Glenwood Springs, a unique mountain town that’s a hub of adventure and history, before being transported back to the Timberline boathouse. 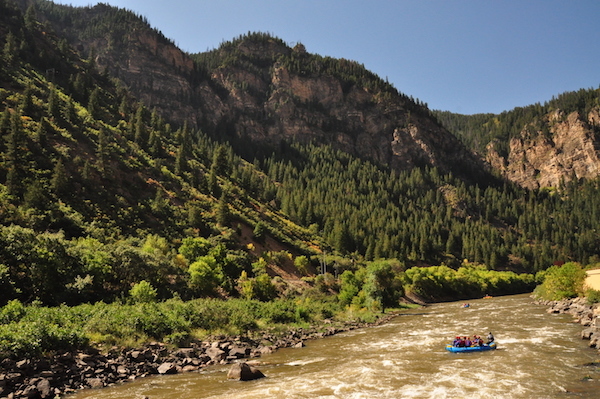 Read on to find out more about the Glenwood Springs rafting, adventure, and history that makes Timberline Tours trips in this area a summer highlight. 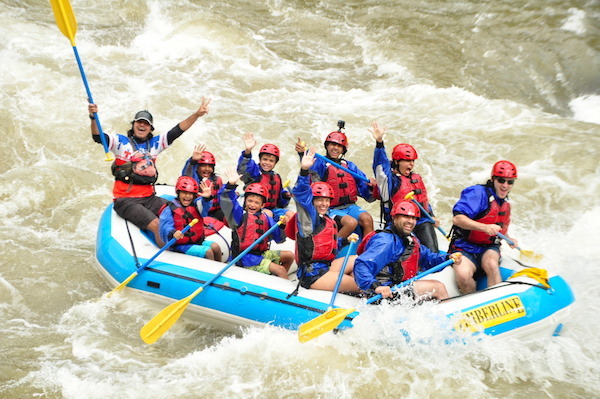 Since Shoshone rafting on the Colorado River is in the area of Glenwood Springs, it’s a good trip choice for visitors to Vail, Aspen, and Glenwood Springs, all mountain towns within close proximity. The Timberline Tours boathouse in Eagle, Colorado, is located between Vail and Glenwood Springs, which allows guests to be outfitted with essential river gear before setting out for the river. At the Timberline boathouse, guides will also lead a discussion that highlights tips for rafting paddling, common rafting paddling commands, and essential rafting safety advice. The Shoshone section of the Colorado River is located between the Timberline Tours boathouse in Eagle and Glenwood Springs. The rafting begins with a mile of Class III (intermediate intensity) rapids, followed by a calm and scenic float. While paddling through Glenwood Canyon, it’s possible to relax and appreciate the awe-inspiring natural beauty of this place. The float continues all the way to Glenwood Springs, a mountain town known for its therapeutic hot springs, the historic Hotel Colorado, and a host of famous people who shaped its adventurous image over the years. Glenwood Springs is also a hub of other adventurous activities, shopping, restaurants, and cafes to explore. The Utes are known to be among the first to come to Glenwood Springs to explore its therapeutic hot springs, which were called Yampah, or Big Medicine, by Ute Native Americans, according to the Glenwood Hot Springs Resort website. There are many opportunities to enjoy the town’s hot springs at locations including the outdoor pool at Glenwood Hot Springs—the world’s largest hot springs pool—at the Yampa Spa’s vapor caves, and the Iron Mountain Hot Springs and spa. While walking around town, you’ll no doubt get a sense of this town’s mining and railroad history—and it’s Wild West flare. Explore Glenwood Springs further with a stay at Hotel Colorado, a historic downtown hotel that has had many famous and infamous visitors over the years including Presidents Theodore Roosevelt and William Howard Taft—and the unsinkable Molly Brown. Find out more about another a notorious Glenwood Springs regular, Doc Holliday—a colorful Wild West gambler, gunfighter, and dentist—at the Doc Holliday Museum. 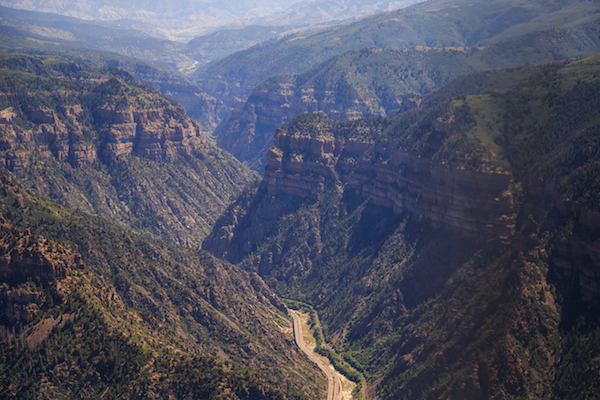 Holliday spent his final days in Glenwood Springs and is reported to have been buried in Linwood Cemetery at a mountain location that overlooks town. Besides being an awesome place to experience Colorado rafting, Glenwood Springs is also a hub of other adventurous activities. The Haunted Mine Drop at Glenwood Caverns Adventure Park was recently named USA TODAY’s Best New Amusement Park Attraction of 2017. Other park activities include cave tours, a giant canyon swing, thrill rides, and attractions ranging from laser tag to a climbing wall. And for those who like to stay grounded, Glenwood Springs is also surrounded by some great trails for hiking, mountain biking, and horseback riding, too.